November 26, 2017 0 comments on "Top 12 Storage Solutions For Small Bedrooms"
On average, we spend around a third of our day in our bedroom, so it ranks pretty high in importance. Spending all that time in there usually means we have a lot of items to use and store in there. If there is one room in a small home that needs some organizing help it is probably going to be the bedroom. 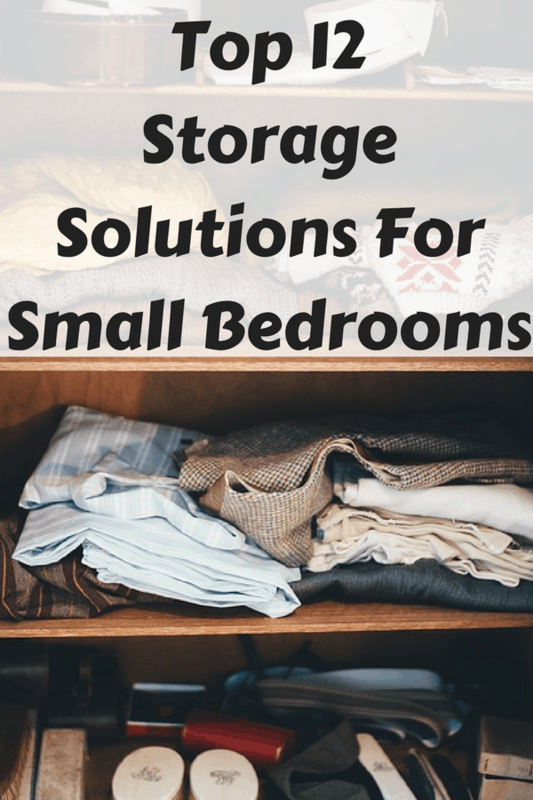 In this article, Top 12 storage solutions for small bedrooms, we will be giving you some ideas on which furniture is best for maximizing storage space and also giving some tips on how to use limited space more efficiently in a small bedroom. Use the upper area of the room – The most unused and valuable space in any small room is the upper areas of the walls. Most clutter is formed on the ground, whereas above ground is rarely used. By mounting several shelves along the upper wall area, you can store books, plants and photos. 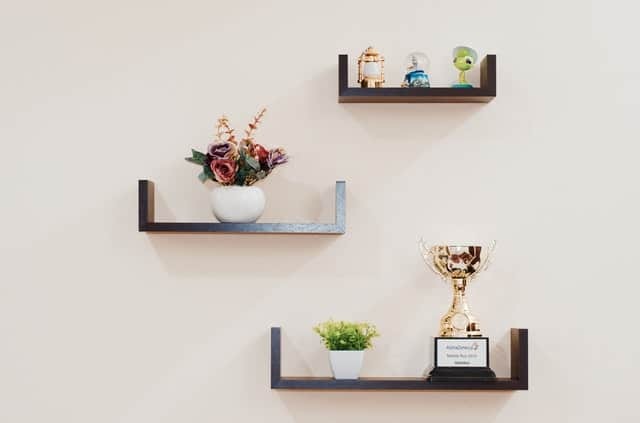 Even a row of shelves near the ceiling can look quite attractive with plants and ornaments on display. Don’t forget the area above the bedroom door. It is an area often forgotten about, however it can be a great place to mount a shelf. Headboard storage – Your bed will not only be the focal point of your small bedroom but it will also take up the most space. 99% of headboards are there for appearance, so by having a headboard with inbuilt shelves and drawers, you have the opportunity of also getting a practical use from it. A storage headboard not only looks great but it also is very useful for storing some easy to reach items. Radiator cover shelf – During winter months, a radiator will be your best friend, however other than providing heat, it has no other purpose and they rarely look appealing to the eye. By putting a radiator cover on, it not only looks a lot better but it also can be used as another place to put some items on. Storage beds – A storage bed is an obvious choice for small bedrooms. Many storage beds have as much available storage space underneath, as a large dresser. Some beds have the drawers already built in, however if you already have a bed on legs and don’t wan’t to buy a new bed, then mobile drawers can be used. These drawers on wheels are inexpensive and very convenient. Tall and narrow drawers and wardrobes – Once more, a tall wardrobe will use the upper area of a small room. A short and wide dresser will take up a lot of ground space, whereas a tall and narrow dresser will provide the same amount of storage space, however it will use the area far more efficiently. Fold up desks – A computer desk is a common piece of furniture found in most bedrooms, however they can take up a lot of space. Instead of settling for a tiny desk, a fold up desk is a good alternative. When not in use, you can fold it up and store it away under your bed or in the corner. Floating vanity tables – Vanity tables can be used for many different purposes and not just for applying makeup. They are useful as a writing desk, study desk and even eating a meal on. A floating vanity desk is a great way of getting all the benefits of a a vanity table, however by mounting it to the wall, it takes up far less space than a standing vanity table. Cabin beds – Cabin beds may be a big investment, however they are like a compact bedroom inside a bedroom. A good quality cabin bed can have a a drawer, bookshelf, desk, chair and even a trundle bed, all underneath the main bed. A cabin bed can have all you need in a bedroom, neatly installed underneath a top bunk bed. Loft beds – A loft bed, just like a cabin bed, allows you to use the vacant upper space of a room more efficiently by having the bed high up. A loft bed is similar to a bunk bed, except the lower bunk is not there. The vacant area underneath the loft bed can be used as a study area or as your storage area. Full length mirror and cabinet – A storage cabinet that has a full length mirror on the door can be a great way of storing all your jewellery in one large cabinet but also have a full length mirror, all in one. In our reviews of the best bathroom storage cabinets for small spaces, we reviewed two full length cabinets with mirrors. They can be easily attached to door hinges or hung on the back of the bedroom door. These cabinets are great for small bathrooms and small bedrooms. Ottoman chairs and benches – Ottoman chairs and benches are very handy pieces of dual purpose furniture. They are often cushioned, designer looking and comfortable to sit on. The beauty of ottoman furniture is that they are hollow inside and therefore a great place to store items. Nightstands with storage – A nightstand can be a difficult piece of furniture to fit into a small bedroom, however if possible they can be handy for close to hand storage items. Here, we chose several small nightstands that are narrow enough to slide into small areas and they also offer some extra storage space for small items. When trying to organize a small bedroom it is important to make the most of the limited room you have. Removing unnecessary items will help a lot when trying to maximize storage space in a small room. We also advise you to look for unusual areas to store things. Thinking outside the box will help you find these unusual areas for extra storage space. For example, mounting shelves above the bedroom door, hanging the mirror cabinet on the back of the bedroom door or even creating a shoe rack inside an ottoman bench. Don’t forget to use wall space and dual purpose furniture as much as possible and you will be well on your way to maximizing storage space and minimizing its footprint. We hope you found the top 12 storage solutions for small bedrooms helpful and found a few storage ideas for you small space.